Have you ever found yourself picking up your phone every 5-10 minutes to check if you got any new notifications? Now, pause for a moment and recall the apps for which you were looking at notifications from. You would most probably be looking if someone has texted you back, replied to the meme you shared on your friend’s wall or if anyone commented on the new photo you uploaded on Instagram. According to Statista, the number of smartphone users in the world is forecast to reach 4.77 billion - let that sink in for a moment. With such a vast proliferation of smartphones in almost every nook and corner of the world, it wouldn’t be surprising to find your grandpa sending you a snap on SnapChat or sending you one of those annoying Good Morning forwards on WhatsApp. Now, it’s great to stay connected with all your friends almost all the time. What we don’t notice is, all those apps which you can’t live without (quite literally) is like digital sugar to your brain - they keep you hooked. Everyday, every hour, except probably when we’re asleep. Why are we hooked to Instagram? 28 months. That’s the time it took for them to reach their first 100 million active users. By the way, there were 4.01 billion smartphone users worldwide in 2013. So, why did it take them roughly about 3 years to hit their first 100 million and just 4 months to hit their 7th 100 million? That’s because designing an app where users constantly come back requires more than just pretty visuals and functional UX. The users must have an emotional connect with the app. And, this involves changing the Human Behavior. How to change human behavior? According to his model, the behavior of a person is influenced by his motivation to perfom a particular action, his ability to perform it and finally, the trigger. Let’s take posting photos on Instagram as an example. Users are motivated to post photos on Instagram because they could be triggered by an event that’s happening in their life, like getting a new car or visiting a new place. Since Instagram is designed in an extremely simple manner, they can easily upload photos. For this to work, all three elements of the Fogg Behavior Model, that is Motivation, Ability and Trigger should come together at the same time. Designing apps to persuade users to change their behavior to achieve what the app is intended to do is one of the most challenging tasks for any designer. But, Instagram has done it. And, let’s see how I think they gained such a substantial number of active users. So, how did Instagram do it? How did Instagram pivot itself from being just another photo sharing app to being the new digital sugar to your brain? From the Fogg Behavior Model, we learned that Motivation, Ability and Trigger should come together at the same time, with the most important being the Triggers. Now, why triggers? This goes to how habits are formed. Triggers are like the spark plug to the Behavioral Engine. For instance, the reason why it’s very easy to get addicted to sugar is that the consumption of sugar is tied to two types of triggers: Internal and External. External triggers could be the sight of seeing a big fat slice of Chocolate Cake. You just cannot walk past without letting it just sit there. And, when you keep seeing these external triggers it will likely get linked to your internal triggers. Let’s say you’re pretty stressed out from work and you want something to make you feel better. You see that big fat chocolate cake and eat it all up to de-stress. Now, imagine you keep doing the same whenever you’re stressed. So, whenever you’re stressed you would be looking for that sugar rush to satisfy your craving. This, ladies and gentlemen, is how you get hooked to sugar. Instagram is just like that big fat chocolate cake. And, it has conditioned our brain to open the app whenever you feel bored or have no one to talk to. What is the reason behind it? It’s because Instagram is extremely tied to our emotions, which in turn becomes an internal trigger. So, how did Instagram create these internal triggers to 700 million of it’s active users? When Facebook bought Instagram in 2012, Facebook had about 955 million monthly active users. All they had to do was to run ads on Facebook to gain new users to Instagram. With repeated conditioning of the users minds to these ads, it was a matter of time until they gained a considerable amount of new users. But, the external triggers are only good for gaining new users. There has to be something that makes them come back again and again. Just like that chocolate cake. That’s where the next step in the process comes into play. There’s a reason why we share photos on Instagram. One, is to tell the digital world that we have a life. Second, is social validation. Think about the first photo you uploaded. And, the first “heart” you received. It made you feel happy that someone likes your photo. Also, think about the first time you got a new follower. You probably had a smile on your face. Instagram hijacks your reward system with their Likes, Follower Count and Comments. The first time you get a hundred followers, you want more. You would want to hit your first thousand. This will motivate you to share more photos there. The first time you get a 100 likes on your photo, you keep posting more with the belief that the next will hit 200 likes. Did you see what Instagram is doing here? They have quite literally hijacked your brains’ reward system which is deeply tied to just 3 metrics: Likes, Follower Count and Comments. The more you get, more dopamine releases in your brain, making you want more of it. This, ladies and gentlemen, creates an emotional connect to Instagram. And, you’re hooked. Now, you don’t need to see ads about Instagram to use it. The triggers are right in your head. Whenever you feel low, you upload photos to seek validation from your followers which ultimately makes you feel better. Or whenever you’re bored, you fire up the Popular tab on Instagram to see what’s trending. If you would like to read in-depth about how Instagram did it, I suggest you read this wonderful article by Nir Eyal. We as designers have immense power and the burdening responsibility to design products that can persuade users to change their behavior for the better. An apt example would be the Activity app on the Apple Watch. By tracking my movements and matching it with my daily exercise goals, it periodically informs me whether I should go for a talk, stand a bit if I’ve been sitting for too long or try some intensive workout. As you keep using it, it becomes a habit for you to achieve your everyday exercise goals thus making you healthy. To sum it up, what you’ve read so far is hardly the tip of the ice berg to designing apps that can persuade users to change their behavior for the better. 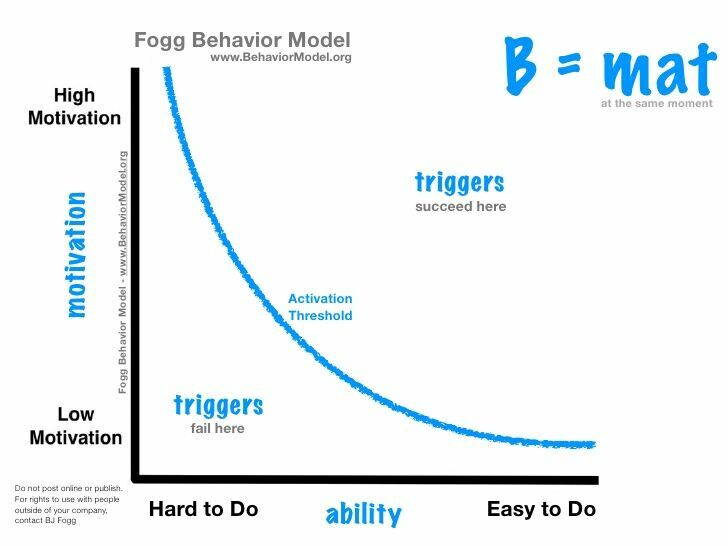 You could try using the BJ Fogg Model along with the techniques highlighted by Nir Eyal to design apps that could help people from quitting toxic habits such as being addicted to sugar, chain smoking or even social media (the irony ). The opportunities are endless!